Have you heard? Blending finely chopped mushrooms with ground meat is the perfect way to bring another serving of vegetables to the plate, add volume to meals and extend portions. The Blend & Extend method will win over even the pickiest eaters when you sneak these nutritional powerhouses into their favourite foods. Mushrooms are rich in vitamins, nutrients and even help boost the already delicious flavours of your home cooked meals, thanks to umami. Last year, Mushrooms Canada brought the Blend & Extend concept to FBC2014 with an Appetizer Spotlight contest, gourmet meal prepared by Chef Ned Bell, and of course our Blogger Testimonial Video! This year, with a whole slew of healthy, mouthwatering recipes, we invite you to try them out in your own kitchen. The idea of blending mushrooms into your ground meat meals is so versatile that it’s easy to introduce it to your own cooking. They blend so seamlessly into your family favourite meals that no one will be the wiser! So, break out that food processor, chop up those mushrooms and wait for the smiles at the dinner table. Looking for a weeknight meal that comes together in a snap? 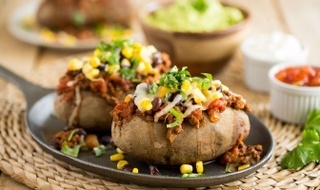 These Mexican style baked potatoes combine all the fun flavours of Mexico into a meal the whole family will love. Preheat oven to 400°F/204°C. Pierce potatoes, several times, with a fork and place on a baking tray. Bake for 45-60 minutes, or until softened all the way through. While potatoes bake, place mushrooms in a food processor fitted with a metal blade. Pulse until finely chopped. In a large saucepan, brown mushrooms, onion and beef, approximately 10 minutes. Add garlic, Tex-Mex seasoning, adobo peppers and tomatoes. Simmer 15-20 minutes allowing flavours to combine and sauce to thicken. Split baked potatoes lengthwise and spoon in meat mixture. Top with black beans, corn cheddar cheese and chopped cilantro. Serve with a side of salsa, sour cream and guacamole.